Amazon.com Price: $82.54 (as of 2019-04-25 04:07:07 GMT) Product prices and availability are accurate as of the date/time indicated and are subject to change. Any price and availability information displayed on Amazon.com at the time of purchase will apply to the purchase of this product. Added molded-in roadways on lid to provide additional play surface. The elastic tie-downs on ends of lid keep it securely attached. Includes eight-piece accessory set, one 60 inch diameter removable umbrella, two bridges, two boats, two pots and one shovel (boat design may vary). Water table side has a convenient drain plug for easy draining and cleaning. 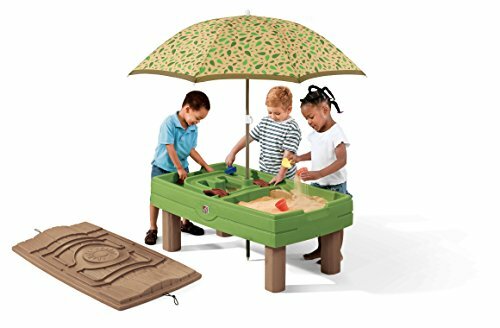 This water and sand table requires minimal adult assembly. Infant Boys & Girls Clothing just $1-$3 @ Amazon!